NASA has tested an "impossible" electric space drive that uses no propellant – and found it works even when it is designed not to. This has sparked immediate skepticism of the technology. The system is designed to use microwave energy reflected along a specially designed chamber to produce thrust. The idea first appeared as the Emdrive by British inventor Roger Shawyer in 2001, who designed a motor that he showed could produce power in this way. But critics scoffed, saying it would violate the laws of momentum. 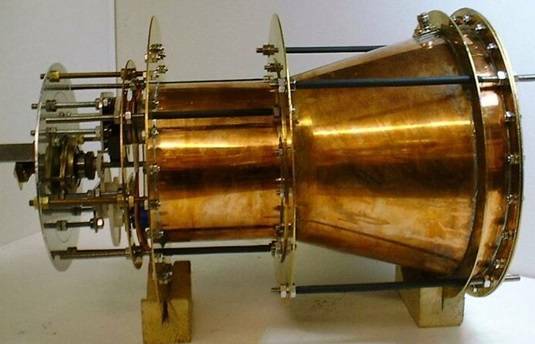 The EmDrive, we're told, generates thrust by using the properties of radiation pressure. An electromagnetic wave has a small amount of momentum which, when it hits a reflector, can translate that into thrust, Shawyer found, and this apparently can be used to power flight in the near-frictionless environment of space. The idea languished, but a decade later the Chinese Academy of Sciences published a paper saying that it too had built an EmDrive-like which, when fed 2.5kW, generated 720mN of thrust – a tiny amount, admittedly. But this got the attention of NASA boffins, who in 2013 commissioned a series of tests on the drive and got some surprising results. In an eight-day trial held by US engineering firm Cannae, researchers found that by using a reflective chamber similar to that proposed by Shawyer, the team was able to use solely electrical input to generate 30 to 50 micro-Newtons of thrust. Again, incredibly tiny, enough to move a grain of sand, but apparently significant. "Test results indicate that the RF resonant cavity thruster design, which is unique as an electric propulsion device, is producing a force that is not attributable to any classical electromagnetic phenomenon and therefore is potentially demonstrating an interaction with the quantum vacuum virtual plasma," the team reported in a paper to the 50th Joint Propulsion Conference in Cleveland, Ohio, at the end of July. Being scientists, the Cannae team also built a second chamber which was designed not to work as a control mechanism, or a "null test article". To their surprise they found that this control engine also generated thrust, although nowhere near as much as the first design. The system isn’t perfect – it requires manual control of the microwave emissions to get the best results – but the Cannae team said an automatic controller was under development and could be used in a scaled-up system. If a larger-scale engine works in the same way as the test system – and that's a big if at the moment – the design could revolutionize space travel as we know it. Potentially it could get us to Mars in weeks rather than the nine months or so currently projected. The weight and cost of fuel needed for rocket motors is one of the key limiting factors in space travel – simply getting one pound of fuel into orbit costs thousands of dollars in launch costs. Spacecraft then need to carry enough fuel to accelerate to their target, and a similar amount to slow down at the other end of the trip, but a fuel-less drive system like EmDrive changes that equation. Instead of firing a controlled engine burn to get up to speed, then coasting towards the target and firing rockets again to slow down, the EmDrive could fire constantly until the midpoint of the mission, powered by solar power cells. At the midway point the engine can then be rotated and fired again constantly to slow down the spacecraft. Other scientists are maintaining healthy skepticism of the new drive's capabilities: some call for more data – the thrust produced looks like a rounding error – and others have written it off as impossible because it appears to break the laws on conservation of momentum. The fact that the control mechanism moved too is setting off alarm bells.